Today's Chicago Tribune has a feature story titled, Hidden Wounds of Violence, which shows how the "exposure to violence is linked to childhood depression, anxiety, post-traumatic stress disorder, learning problems, sleep difficulties, poor academic performance and a host of other problems." With inner city neighborhoods serving as a war zone, no wonder school performance is low and drop-out rates are high. A few years ago I attended a funeral for one of our students, where I met others who had also been part of the tutoring program started at Montgomery Ward in Chicago. One told me "we don't expect to be alive at age 25". At the end of this article, the parent of the student featured in the story said, "she has enrolled him in tutoring, mentoring and other programs to give him an outlet for his energy in a safe, indoor environment." Tutoring/mentoring programs that operate in the non-school hours can be one way to surround youth with a network of caring adults and a variety of positive learning reinforcements...but only if they are available. 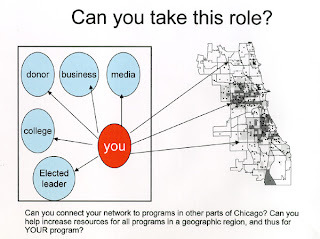 You can learn about tutor/mentor programs serving Chicago by searching the Program Links, or the Program Locator database on the Tutor/Mentor Connection web site. As Cabrini Green is being redeveloped, many potential donors think there no longer is a need for such programs, making it difficult for Cabrini Connections and others serving youth in this area to find donors. However, Cabrini Green is fortunate. For too many kids there are no tutor/mentor programs in their neighborhoods, or the ones that exist are too small, or not well developed. We're trying to change this but we need your help. While the Mayor and others are holding their own meetings, we're hosting a Tutor/Mentor Leadership and Networking Conference on May 29 and 30. It's at Northwestern University School of Law. I hope you'll spread the word and encourage potential donors, sponsors, business partners, and faith leaders to attend so they can connect with existing programs, and learn how to create new programs in areas with high violence, but few programs. There is an alternative to hanging out on streets, getting involved with gangs, and senseless acts of violence. This Peace Mural was created by students and volunteers who are part of an art club at Cabrini Connections, a non-school volunteer-based tutoring/mentoring program serving 70-80 7th to 12th grade teens living in the Cabrini Connections neighborhood. This "College Bound, No Doubt About That" music Video was created by another group of teens and volunteers at Cabrini Connections. This program offers teens an alternative choice of ways to spend their non school time, and connects teens with a wide range of adult volunteers who serve as mentors, tutors, coaches, friends. There are many similar programs in the city. They all are constantly looking for private sector donations to fund their operations. If you want to stop the violence, invest in these programs. Make a donation today. However, the problem we face is that there are not enough of these programs, especially in the South and West part of Chicago and South Suburbs. Good programs don't grow overnight. They take years to grow. Cabrini Connections started in 1993 with just five teens and 7 volunteers. You can search the zip codes in the Chicago Tutor/Mentor Program locator to learn about existing organizations offering various forms of tutoring and/or mentoring. When you look for more comprehensive tutor/mentor programs, or programs serving high school youth, there are very few in many areas. If the city wants to really make a difference, it needs to encourage businesses, churches, hospitals and universities to build long term, adopt a neighborhood strategies that make more and better tutoring/mentoring programs available in more places. This is not a short term strategy. It is an investment in peace. It will pay dividends the longer donors and leaders stay involved. Want to know more? Come to the Tutor/Mentor Leadership and Networking Conference on May 29 and 30 and meet some of the people who lead these programs. I'm a fan of maps. 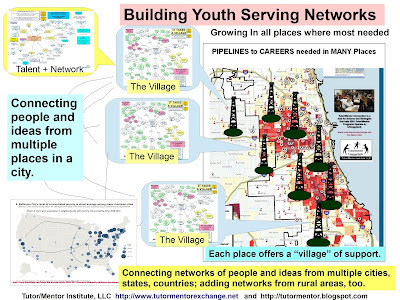 If you search "maps" on this blog you'll see many ways I use them to draw attention to inner city poverty, and to draw resources to tutor/mentor programs in all parts of the city. I found two new reports this week that use maps to illustrate social justice issues, such as the concentration of large high school drop out populations in big city neighborhoods, or lack of public health resources for prisoner re-entry support in inner city neighborhoods. 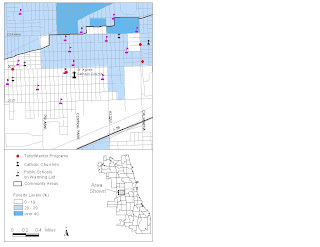 What is important, is that the neighborhoods in both reports are the same neighborhoods. Thus, why can't we find ways to align our programs, and our resource providers? These reports are PDFs and the links are posted on the T/MC web site. Find Cities in Crisis here and find NYC Mapping Health Care as the latest addition here. A while back I wrote about a CEO Summit that was held in New York in February. It's goal was to encourage corporate volunteers to use their talent to help build non profit infrastructure. Today I had a conversation with a representative from Verizon who pointed me to the Verizon Foundation web site. I've been here in the past, and have links to the site on the T/MC web site, but the foundation has done a great deal to update the information and presentation since I was there last. One thing that is new is the addition of Thinkfinity which provides free resources to teachers. Sites like this are great resources for tutors/mentors and parents, too. One of the workshops at the May 29 and 30 Conference will be presented by Thinkfinity, which can help local programs learn more about how they might use this resource. Another section on the web site was a Resource Center providing information non profit leaders could learn, and use, to build more effective organizations. I think these resources and the information on the Verizon Foundation web site are great. However, for small and medium non profits, who are struggling with survival and everyday issues of doing business, this represents a wealth of learning, but not the manpower to put this learning to work in the organization. The idea of the CEO Summit was to draw talent from business who could do needed work in the non profit sector. Some people have interpreted this as "project based work" such as "build your employee handbook" or "build your web site". However, as a non profit leader, I know that once I have the handbook, or the web site, I need manpower to manage the use of these resources in my organization on an on-going basis. Thus, my goal is that corporations begin to encourage people in their companies who have the skills shown on the Verizon Foundation Resource Page, to offer their talent on an on-going basis, in causes that require on-going application of time and talent to get a result. I have created a PDF that illustrates this intermediary role that leaders in business, churches, colleges, etc. can take to connect people who can help, with places and organizations where help is needed on an on-going basis. I'm going to be reaching out to Verizon to ask for their help in communicating this message, just as I've been reaching out to churches, colleges, lawyers and leaders of other tutor/mentor programs. If you're already connecting your corporate talent with non profits on an on-going basis, why not come to the conference in Chicago on May 29 and 30 and do a workshop to share your story. Or, add the link to your corporate resource page to the T/MC links library. Today an article on page 12 of the Chicago SunTimes talked about a "new study being commissioned by the Mayor of Chicago to find way to attack roots of crime". In the article the writer said, "It won't be the first time" such a study was commissioned. She then wrote about the Daily-appointed Youth Development Task Force which released a "Chicago for Youth Blueprints for Change" report 15 years ago. So, she said, "Why conduct yet another study?" I have a copy of that first study. It's a powerful call to action, with one statement saying "If we expect young people to meet their needs in a positive manner, we must see to it that positive opportunities are in their lives." What frustrates me about this is that one of the programs referenced in the index of the 1994 report was the Montgomery Ward Cabrini-Green Tutoring Program, hosted at the Montgomery Ward Corporate headquarters in Chicago. While the researchers thought enough of the Wards program to include it in the report, the did not even bother to interview me, who had been the leader of that program for the previous 17 years! We were starting the Tutor/Mentor Connection at the same time the 1994 study was being created. We operated in donated space at the Montgomery Ward headquarters, so it would not have been too difficult to invite us to share our ideas of what it takes to build and sustain a comprehensive volunteer-based tutor/mentor program. However, nobody bothered to ask. If they had we would have told them what we had learned, and what we believed would be a way for the city to make more and better non school tutoring/mentoring and learning resources available in high poverty neighborhoods. We would have shown them the T/MC strategy, and the way we were building a database of existing programs so that new support from the Mayor, business community and philanthropic partners could support the growth of existing programs instead of creating new ones. We would have shown how we were using maps to illustrate where these programs were needed, so that new programs could have been formed in areas where their are voids. 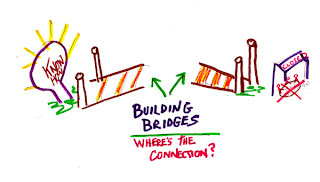 Part of our problem is that we're working in silos, with business people talking to each other, foundation people talking to each other, university people talking to each other, and none of us are crossing these groups to interact and learn from others who are focused on same issues. There are ways to change this, using the Internet as a collaboration portal. We've met with people from the Mayor's office, the universities, local businesses, the United Way, and shared all of this information freely on the T/MC web site. While more than 100,000 people visited the web sites in 2007, we don't know if any were decision makers who were looking for a strategy that would not only end violence, but would make more and better learning and mentoring networks available to help kids through school and into careers. Maybe what we write does not make sense. Thus, we've created graphics to try to communicate these ideas. You can see a couple on this blog. Search "maps" and you'll find more. Visit the Tutor/Mentor site at ning.com and you'll see more. Read the essays on the Tutor/Mentor Institute page and you'll find more. While we can't change what happened 15 years ago. My hope is that the next round of researchers will try to learn from the experiences of people who have been in the field working to connect kids, volunteers and learning experiences for many years. Every day I'm contacted by people from Chicago and other cities who are asking for information related to tutoring/mentoring. This happens because I also spend part of each day in many forums where I share information and invite people to get connected to the information I host on the Tutor/Mentor Connection web site. Here's a collaboration presentation I'm sharing today. My aim is to draw more people to the web library, and to the conference we're hosting on May 29 and 30 in Chicago. By doing so we help program learn ways to improve their programs over the summer, so in August when school starts they can recruit more volunteers, serve more kids, and have a bigger impact on aspirations and learning. By drawing more people to the conference, we create greater public visibility, and hopefully draw more dollars, and talented volunteers, from business, universities and churches so that each program has the resources do put the good ideas to work in their own programs this summer. If you click into the links on the left you can find many places where I network and share ideas. These are places where you might also find valuable ideas or share your own knowledge and experience. I hope to meet you in one or more of these virtual communities, or at the May conference. I'm sitting in a workshop at Dominican University where speakers are sharing ways libraries and Community Technology Centers can use technology to serve their communities. Great ideas. I've set up a discussion which I hope speakers and participants will use to keep talking to each other after today. Just finished listing to Jenny Levine talk about gaming and how libraries can adopt gaming in positive ways. Visit her site to see the full presentation. These are inspiring ideas. How to spread them through tutor/mentor programs or to other communities is the next step. A feature in today's Chicago Tribune and Chicago SunTimes was the closing of St. Francis Hospital in Blue Island, as South Suburb of Chicago. SSM Health Care, the owner of this hospital said "the hospital is racking up huge losses" and that "other hospitals that serve large populations of uninsured or under insured patients could follow St. Francis' path. This reminds me of a Chicago Tribune article of July 10, 2002, with the headline of "Financial hemorage", and a subhead saying "Hospitals serving the poor are bleeding red ink as the uninsured ranks grow, health-care costs climb, and more government cutbacks loom." I've had a strategy to prevent this on the Tutor/Mentor Connection web site since 2002. It's a Hospital T/MC Leadership Strategy. You can view it here. My belief is that hospital leaders who support the growth of comprehensive volunteer-based tutor/mentor programs in the geographic area of the hospital, and use those programs to deliver preventative health messages to youth and families, can not only reduce the number of visits to the emergency room, but can also address another cost of operations by encouraging young people to consider careers in health care. Read the pdf and look at some of the links posted on the T/MC web site. If you're a board member, doctor, leader of an inner city hospital, or a community leader in a neighborhood that may lose its hospital, I encourage you to bring some of your peers to the May Tutor/Mentor Conference in Chicago and begin investigating ways you can take this leadership role in your community. The costs to be a leader are low because you're mobilizing others who are doing business, operating churches or universities in the region to share the costs of having tutor/mentor programs in the neighborhood. Your role, as the major business in many of these communities is a leader, a mobilizer, and an advocate, using your facility as a meeting place, and encouraging your medical personnel to be mentors. If you'd like help understanding this, email tutormentor2@earthlink.net and let us help you. Today the feature editorial in the Chicago Sun Times is Come out and rally for kids slain by guns. As this was being written, another youth was slain last night. I'm all for marches, and the intent of this is to get the state legislature to enact gun control laws. However, I'd like to see community leaders spend some time thinking through a strategy that would create more places in neighborhoods where kids could connect with a diverse range of adults and learning experiences, with a long term goal of helping kids to careers instead of jail, or graves. I've attached a map to illustrate this thinking. The map was created a few years ago by the Tutor/Mentor Connection and shows the West side neighborhood surrounding St. Agnas church. The area North of the church has poverty levels of 20% or higher. There are 8 under-performing public schools in this area. However, there are no organizations doing any form of volunteer-based tutoring and/or mentoring(that we know of) other than two shown on the East side of this neighborhood. Thus, most of the kids in this neighborhood have few resources to help keep them focused on positive activities during non school hours. That's a contributing factor to poor schools, high drop out rates, high gang violence, and a high level of juvenile and adult incarceration. This map only shows the Catholic churches in the area. Instead of marching in downtown Chicago, someone ought to be asking the Cardinal how these churches are supporting a tutor/mentor strategy. Are they hosting programs? Are they hosting neighborhood meetings? Are they partnering with Catholic churches in Oak Park or further West, to draw volunteers and donors to support existing or new tutor/mentor programs? Until the neighborhood has more and better non-school learning supports, and builds connections between the youth in the neighborhood, and the adult and business resources beyond the poverty areas of the city, it's likely we'll continue to see youth making bad decisions, and youth high school drop out rates continuing at a high level. You can find more articles like this in the Tutor/Mentor Institute web site. 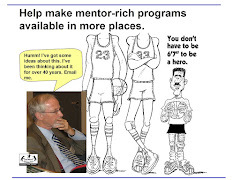 You can also find links to existing Chicago programs and a searchable database of Chicago area tutor/mentor programs. If the purpose of editorials and marches is to mobilize volunteers, and donors, and support the growth of comprehensive, long-term learning and mentoring programs in high poverty neighborhoods, we can begin to predict future change in the tragedies that are taking place in Chicago and other big cities. Without a map-based strategy it's likely there will be too many marches, too much talk, and too little action. If you're interested in building tutor/mentor programs, or supporting them, come to the Tutor/Mentor Conference on May 29 and 30 in Chicago.